Your aerial should be vertically polarised. If it isn't then it may still work but may give less strength because it is at right angles to the signal. For the Dolgellau transmitter the aerial used for the former analogue will be suitable. 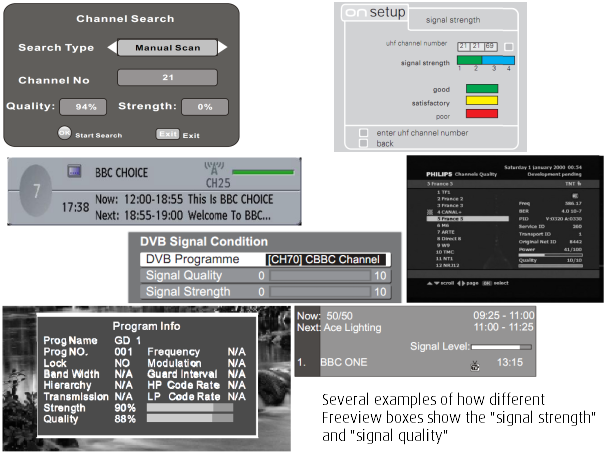 Judging by the Digital UK predictor you don't have any chance of receiving the COM channels. Your 100% right, I only get the PSB Channels not the COM ones. Wish I had known that before getting BT. So Im not sure if this is the right place but is there any way to get the COM channels of the same set up ? I am not familiar with BT's offering with respect to what you can get streamed over the broadband connection. I do know that the two BT Sport channels are carried on one of the COM multiplexes so you won't be able to receive them over the air. I'm not sure whether BT will provide them over your broadband connection. BT tell me that if you have the DSL internet service from BT Internet and at a speed above 5.6 Mbps then you should be able to view BT Sports. As I only get 2.5 Mbps I am unable to confirm whether this is true nor what the performance is like. Clearly having a fibre-based internet service will give faster broadband speeds and hence better viewing via IPTV but the roll out of fibre is still somewhat limited across the country, especially in non-urban locations, and many towns are not yet equipped and some are at last 'taking orders'. At a price premium of course! MikeP: From what I have been told, it's not a question of the line speed alone, but a question of the infrastructure supporting IPTV. The BT Infinity product has a new "back end" which has "edge servers" that can supply IPTV. I'm in a very urban location and there is no sign of BT Infinity here. I'm a BT Internet ADSL customer and they tried to sell me the BT Sports package but when they looked at the speed provided by their line feeding my very rural home they admitted it needed to be at least 5.6 Mbps (we're lucky to get 2.5!) with no mention of any infrastructure requirements. I can only go by what they tell me. Clearly, we won't be getting FTTC (nor FTTH/P) anytime soon, it's only just reached the main town 17 miles away! Personally, I would not have taken the package anyway as we are not fans of almost all the sports they are showing, especially commercial football. All BT Broadband customers can watch online at btsport.com and download the app to watch on their smartphone and tablet, at no extra charge. That appears to be suggesting that ADSL customers with BT Internet (as oppposed to BT Infinity) can indeed get BT Sport. You can watch the action on your PC or Mac, or on your smartphone or tablet using the BT Sport App. You need a BT ID to access the BT Sport App and watch online. If you don't have a BT ID yet, you can sign up to My BT now. That also suggests that BT Sport can be viewed without having to have BT Infinity. I suspect that the actual throughput speed (as opposed to the sync speed) needs to be adequate to provide a jitter-free experience. Living just 7 miles from Stockland Hill mast in east Devon I would presume that we are in a"strong reception area". yet having had to move the aerial from our chimney to a mast mounted just above eaves height, we seem to have lost some Freeview channels. Bough a meter and got maximum reception indicated, still am only getting 67 FV channels. Its seems that if we get ITV strong then BBC is weak. We have a happy medium, but ITV4 has completely disappeared, despite several retunes. grateful comments and guidance, do I need to have a class 1 aerial for example? I have a Logik TV with inbuilt freeview/DTV. The aerial was plugged into the back of it directly from the wall and although all the channels were there, the signal on some of the channels would be weak and the picture and sound would be effected. Therefore I have bought a one for all signal amplifier. Having plugged it in, I have re-tuned the TV but instead of having improved signal, I have lost lots of the channels! After trawling the internet, I can't find any reason why this would happen. Any help or suggestions would be really appreciated! Richard: Although an over powerful signal can indeed cause problems, its impossible to assess as to whether or not this is likely to apply in your situation unless a post code is supplied.